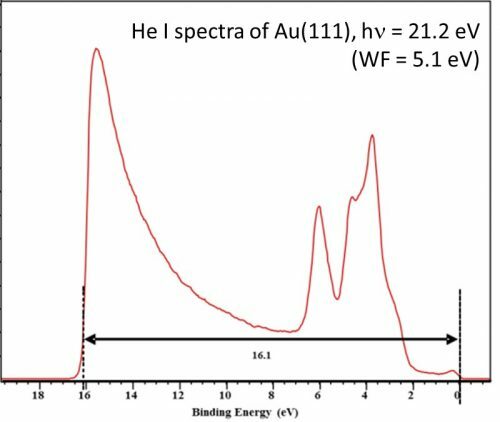 Ultraviolet Photoelectron Spectroscopy (UPS) is similar to application to XPS, the difference being that the ionising radiation, typically below 50 eV, are used. Ultraviolet photons are produced using a gas discharge lamp typically filled with helium (argon and neon can also be used); the photons emitted by helium gas have energies of 21.2eV (He I) and 40.8eV (He II). As lower energy photons are used, most core level photoemission lines are not accessible using UPS, so spectral acquisition is limited to the valence band region. Systems at Harwell and UCL are equipped with UPS capabilities.